It is for the most part a silent stroll on which we, a group of twelve twenty- and thirtysomethings follow greek artist Maria Mitsopoulou through the Treptower Park in Berlin. One could also call this Artist walk a sequence of performances lasting almost two hours. 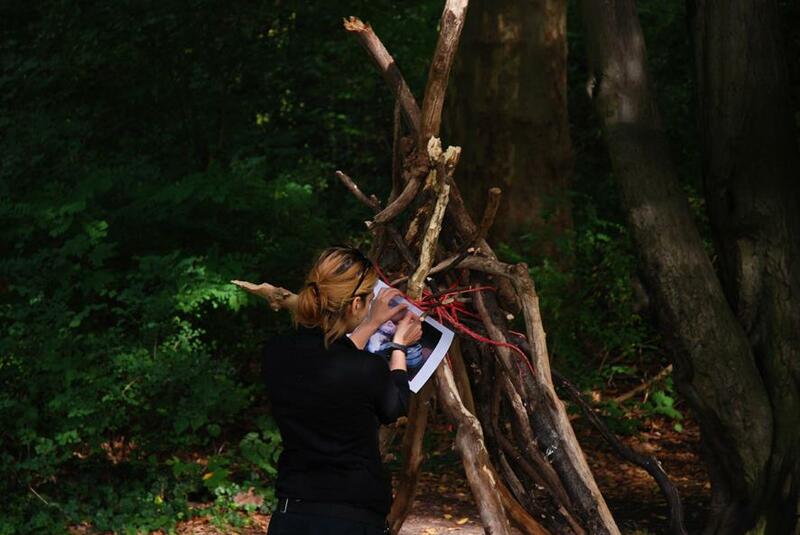 At first our group is led to a small wooden sculpture made of loose wood which is mildly resembling a Tipi without the sheltering canvas wrapped around it. Ceremonically the grainy printout of a photo is pinned to the structure. A laptop is put on the green grass, speakers aside it and a paper is handed out by the artist, going slowly from one to the next. It is a strange little song written on it. It is about a father, a son, a raven and – death, mixed up with a refrain taken from an old german folksong. The initiation ritual for this walk thus commenced: all sang together along to the music played with the laptop. The idea of these artist walks is to give new perspectives of ones city, on concepts of perception and an insight in the work of the artist which is making the tour. Naturally the approaches can be very different, not only because the phenomenon „city“ can be dealt with in such different fields as „history“, „architecture“, „social-space“ and so on, but also because artists mostly do have a very special way of trying to tell the story or making their point. – The performative though silent route taken here at first startled me a little bit but in the end it just worked out fine. After finishing our initiation ritual the artist led us on a small trail to the famed soviet war memorial. Here she puts on some rather funny looking high heels and slowly leads us from stele to stele, on them scenes depicting the war, starting with the attack of nazi germany on russia, and quotes from Stalin. 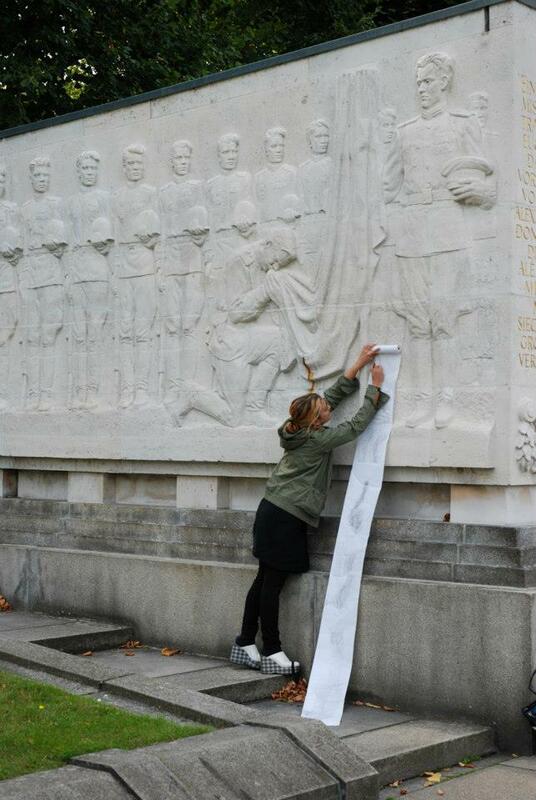 With a graphit pencil and a long roll of paper, the artist captures details from the steles and the quotes like archeologists did in the old times, inviting the participants also to help her hold the paper roll, its tail gettint longer and longer on the way. In the end it is a real circumnavigation of the inner site with the steles. Afterwards our group was led through small paths to a nearby sea, the so called „Karpfenteich“ (carp pond) and onto a clearance right beside the pond where the statue of the Nök, a water ghost like creature, is placed some meters ashore inside the lake. Here it is layed out a picnic blanket and we sit together, eating grapes out of a bowl with little banners sticked into them. On the banners there are headlines from greek newspapers printed on – mine says: a difficult year. Who would not think about the crisis and the more than problematic times greece is momentarily going through. Alongside the grapes we are presented with a sketchbook that resembles a graphic diary. After some smaller discussions, suddenly a person appears on the statue of the Nök out there in the pond. After looking at us silently for a moment, the person swims ashore, gets out of the water and steps up to the artist. With intense stares and feeding each other grapes, the swimmer (surely impersonating the Nök) bonds the artist in a rather artistic way until she resembles somewhat a mermaid – the long tail of paper on which the details and words from the memorial were captured is at the end layed out and pinned to the rope, resembling a fin. The swimmer now takes the artist in the arms and takes her into the water, deep down, until they vanish behind the staue of the Nök. hello! thank you so much for coming and the review! m.m. It’s going to be finish of mine day, but before finish I am reading this great piece of writing to increase my knowledge.